One thing is for sure, 2017 is the year of artificial grass, many are now deciding that it’s low maintenance and aesthetic look is for them. Whilst it’s popularity might be on the rise it is still a divisive subject which some considering it to be fake and tacky. 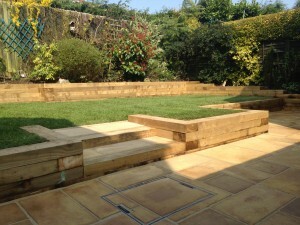 We at Groby Landscapes are pleased to introduce you to natural looking and high quality options when it comes to your lawn. 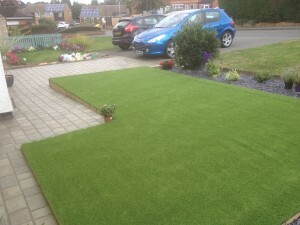 Across the UK we are starting to see large areas covered in artificial grass. This includes Caerphilly and the Valleys in South Wales where the Arms Park lead the way with using it on it’s all purpose pitch. Many households in the area are deciding against traditional grass and going for the zero maintenance option. In other areas of the UK it has been installed in children’s play areas, this covers the area in grass that may look realistic but is kind to those children with hay fever. It provides a soft ground without the need for digging or planting. Recently Wimbledon advertised “grass” seats for hire. These are seats made entirely from artificial grass and show the flexibility and creativity that artificial grass can bring about. Whether it’s sitting on it, having it indoors or even using it for mini golf. 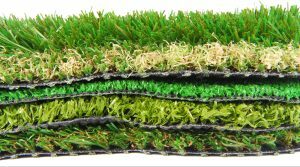 Many falsely believe that artificial grass just comes in green, that couldn’t be further from the truth. There are not just a variety of colours available, everything from pale green to purple but there are also a wide range of styles. You can order thick long grass or small well cut grass. It can look as natural or as fake as you’d like it to look, it can be mixed with different shades to make it look diverse or it can be one colour throughout. The installation of artificial grass still requires an even surface and works with an aqua flow system, so that you don’t get flooding when it rains. The aqua flow system works underneath the artificial grass itself draining the water back into the soil below and ensuring it’s not only environmentally friendly but does not cause problems within your garden. To get started with artificial grass in the Leicester area simply give us a call on 0116 2386039 to arrange a no obligation quotation. We quoted based on square metres of artificial grass required, so please have this to hand, we can make some suggestions on how we create the foundations and how you can decide on the right type of grass for your lawn.